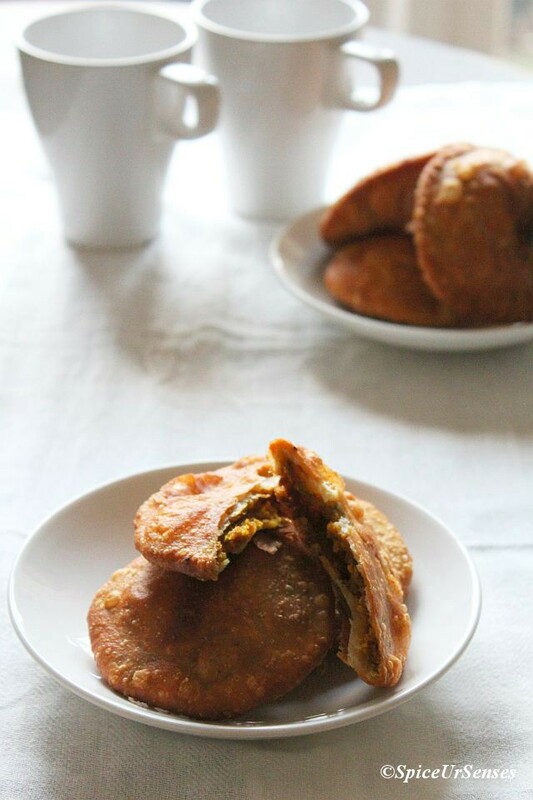 Moong Dal Kachori is a easy to make and very very tasty to have with hot cup a tea for a breakfast or as a evening snacks. This recipe is sitting in my draft from ages, Since the climate is getting cold here so I think it's a right time to post this recipe.. I have taken this recipe from NishaMadhulika.com and thanks to her for such a awesome recipe. Do try and let me know. Take maida in a big bowl, add salt and oil and mix well. Now add little water at a time and knead soft dough same as required for making chapatti. Don't knead the dough too much. Cover the dough and keep it aside for 15-20 minutes to set. Meanwhile prepare stuffing. Coarsely ground the soaked moong dal. Set it aside, Preheat pan and add 2tbsp oil in it. When oil is hot, add cumin seeds and saute for while. After sauteing cumin seeds add hing, green chilly, red chilli powder, coriander powder, ginger garlic, fennel powder and saute the spices for few minutes. Now add grounded dal, salt, garam masala and dry mango powder. Mix all ingredients really well. Stir constantly and cook dal until it dries. Take out the roasted dal in a bowl and allow to cool. Take little amount of dough, equal to size of lemon, and roll to a round shape. Take one dough ball and flatten it with help of your fingers giving it a shape like bowl. Now fill this bowl with 1 tsp stuffing and lift from all sides for sealing the stuffing. Likewise prepare all kachoris. Preheat a enough oil in a deep frying pan for frying kachoris. Oil should be medium hot for frying kachoris and now roll the stuffed dough ball with your hand or fingers gently into thick kachori. Place the kachori in medium hot oil for frying. Place as many kachoris as possible in the wok at one time. 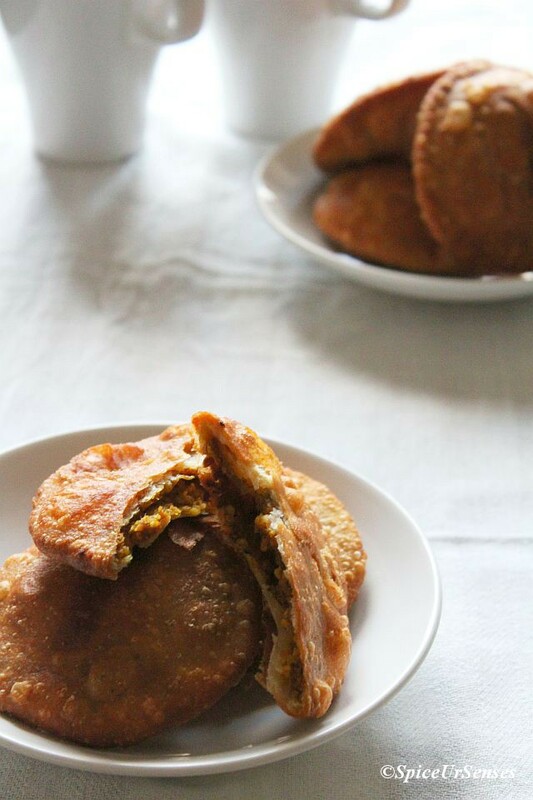 Flip the side when kachoris turn puffy and are slightly brown from beneath. Keep flipping the kachoris and fry until they turn golden brown in color. Keep the flame low and medium, to get crunchy and crusty kachoris. 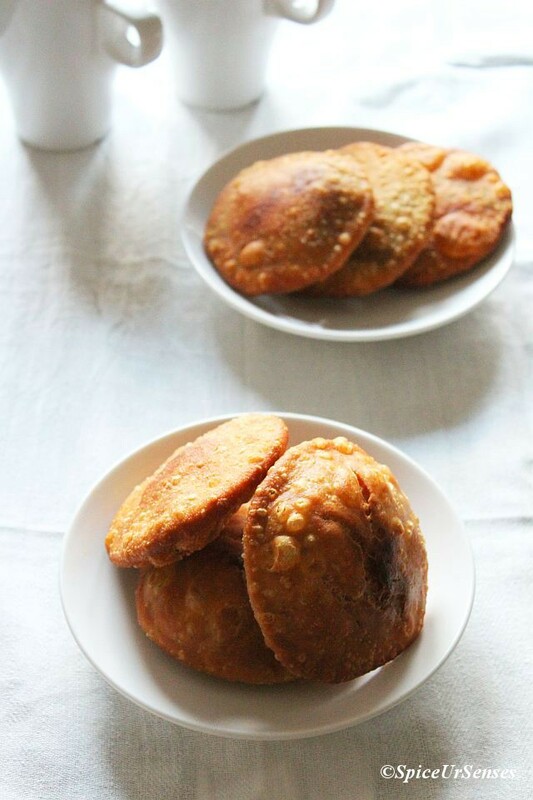 Place the fried kachoris over a plate with absorbent paper. Likewise fry all kachoris. Serve kachoris with green coriander chutney or sweet chutney or you can even eat them as it. Delicious! I love esp. that mung bean filling.